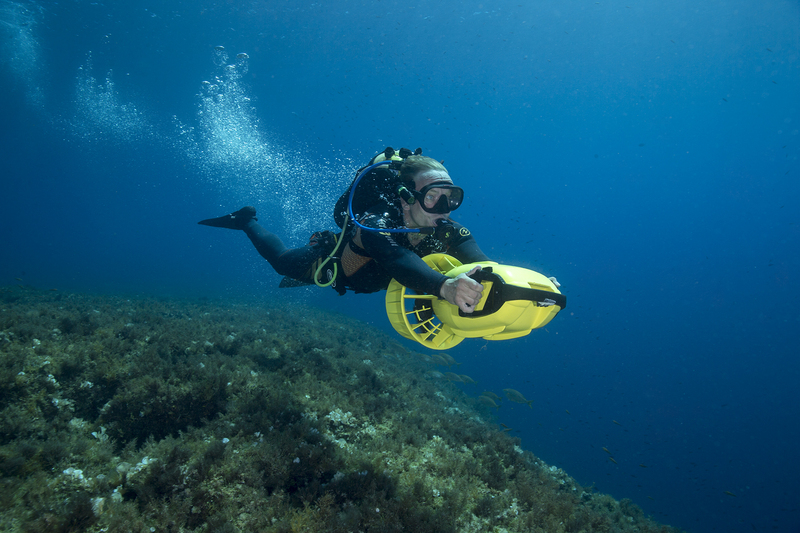 The Mission Blue team conducted an expedition to document and raise awareness around the importance of MPAs and the negative effects of overfishing, illegal anchoring, and plastic pollution in the Balearic Islands Hope Spot. The expedition was co-organized with our partners at Asociación Ondine, Drifters Project, Plastic Pollution Coalition and Bonnie Lass Charters. Finally, a very special thanks goes to Biotherm WaterLovers for making this expedition possible through their generous support of Mission Blue’s expeditions program. 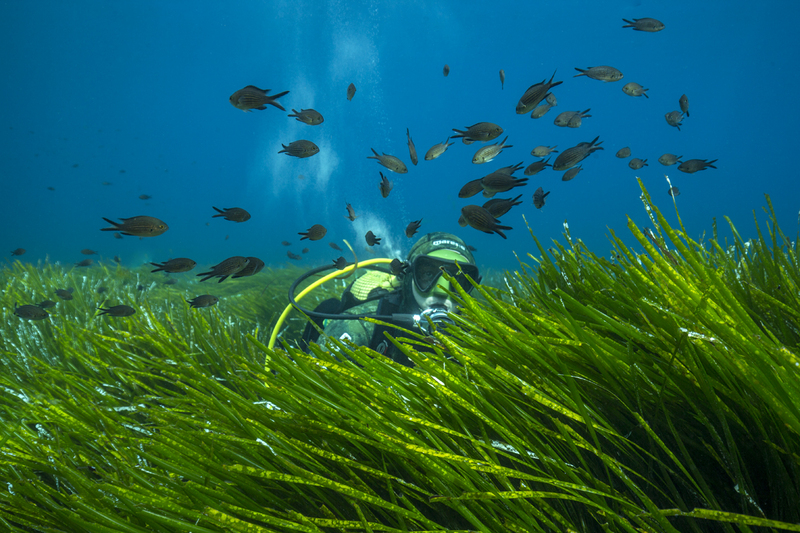 Posidonia oceanica meadows are found off the shores of Formentera and Ibiza in Spain’s Balearic Islands Hope Spot, where Mission Blue Director of Photography and Expeditions, Kip Evans, led the latest Hope Spot Expedition. Endemic to the Mediterranean Sea, Posidonia oceanica grows its blades to peak length in the summer, reaching up to two meters and creating dense thickets where a wide variety of fish and invertebrate species find shelter, food and mates. The plants—also known as Neptune Grass—then shed their long leaves and begin growing new ones throughout the winter. Discarded leaves wash onto beaches and protect them from erosion. Calcareous epiphytes that live on the leaves fall off and fertilize the sand dunes. In the water, plastic pollution looks to many sea creatures like a source of food. Sea turtles mistake plastic bags for jellyfish—their prey—and fill their stomachs with them, sometimes to the point of starvation. Fish, invertebrates and seabirds mistake microplastics for fish eggs and suffer similar consequences. Plastic bioaccumulates in the body tissues of predatory fish like the Mediterranean’s endangered bluefin tuna (Thunnus thynnus), and consequently in the humans who eat them. Despite its harmful impacts, plastic pollution may offer a cause for hope. With its colorful snarls of recognizable objects from our daily lives, plastic pollution is a visibly compelling threat that can inspire public action where more abstract issues like overfishing and climate change often fall short. It can even serve as a “gateway cause” to engage the public and policymakers in broader ocean conservation measures. Bringing the issue of plastic pollution to the surface through art and other creative forms of communication can make people relate and inspire them to do their part to limit their impacts. Strongly protected marine protected areas (MPAs), which regulate human impacts in designated zones, are known to help alleviate the effects of threats like climate change and overfishing and may help safeguard Hope Spots such as the Balearic Islands for the future. As plastic pollution is such a strong potential gateway to spark interest in marine conservation, management plans for MPAs in the Mediterranean (and beyond) should include it as a threat to address. Just as MPAs regulate fishing and oil drilling, they can help control the release of plastic into the environment. The Balearic Islands would greatly benefit from stronger enforcement and expansion of its MPAs in addition to the inclusion of plastic pollution as a priority issue.